Concorde is making its final flights on Friday, ending 27 years of supersonic travel. Celebrities will experience the last of three flights on the day, as the plane flies from New York to London. Thousands of people are expected to gather at Heathrow airport to see the trio touch down at about 1600 BST. The first of the planes departed from Heathrow at 1035 BST for its return flight to Edinburgh. It arrived in the Scottish city shortly before noon. A second is completing a supersonic loop over the Atlantic before returning to Heathrow. The third, the last leg of a return flight to New York carrying about 100 people, includes a businessman who booked his ticket a year ago before the plane's retirement was announced. Actress Joan Collins and British broadcaster and frequent flyer Sir David Frost are also expected to be on the plane. Water cannon will spray it with jets of red, white and blue water to evoke the colours of the British, American and French flags in a symbolic farewell on the runway at John F Kennedy airport. Model Jodie Kidd, checking into the flight, said she had used the supersonic plane dozens of times because she liked to get to New York "before I took off in London". "I always really love the rush of takeoff. I am just a speed freak." Heathrow airport operator BAA has built a 1,000-seat grandstand for spectators. But the company, together with police and Highways Agency staff, warned other would-be spectators to stay away from the Heathrow area and watch from other positions, or see the final landings on television. British Airways chief executive officer Rod Eddington said there was a "mixture of sadness and celebration" about the retirement. "It is a wonderful plane, an icon, but its time has come. It's an old plane - it doesn't look it - but it was designed in the 50s and built in the 60s," he told BBC One's Breakfast. He said one of the reasons for retiring Concorde was because economic conditions had meant the "vast majority" of Concorde's regular customers had not been flying on the plane over the past two years. For the plane's outward journey to New York, over 1,000 people gathered at Heathrow airport to watch it take off for the 3-1/3 hour flight. The £9,000-per-ticket plane reached 1,350 mph and 60,000ft over the Atlantic Ocean shortly after it took off at 1920 BST on Thursday. Although it is not known yet exactly what will happen to the decommissioned planes, some will be given to museums. Mr Eddington said a decision would be made in the next few weeks about whether a "heritage plane" would be kept flying. The downturn in the world economy left the plane struggling for business, with top corporate executives taking fewer flights. The fleet also never really recovered from the crash of Air France's Concorde aircraft outside Paris in July 2000. The French planes retired in May and BA said the high cost of spare parts meant it could not continue. Boss of Virgin Atlantic, Sir Richard Branson, whose offer of £1m per plane was refused by British Airways, said Friday should not be the last day for Concorde. 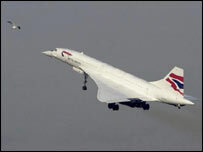 "It is a very sad day, but we will keep up the campaign to keep Concorde flying," he said. 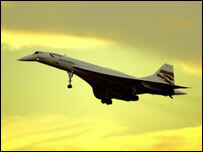 "At the very least a heritage trust should be set up to keep Concorde in the UK so future generations can see it. "It would be terrible if future generations could never see it fly." "It is a poignant day for aircraft engineers"